A species indigenous to North America, shagbark hickory trees are widespread in the Eastern U.S. in zones 4 to 8. They are related to the pecan, another native American nut bearer. Although they can reach a height of 130 feet in some portions of their range, these popular nut trees often reach only about half that size. They grow in full to partial sun. Shagbark hickory trees are slow growers if left to their own devices, so you will need to cheat if you wish to plant one and harvest home-grown nuts from it sometime soon. It would just take too long to enjoy a harvest if you tried raising seedlings from the wild. Nurseries that sell commercial cultivars do the cheating for you by employing grafting techniques that produce superior specimens. These cultivars can yield a harvest in as little as two to three years. Examples of cultivars are 'Grainger,' 'Abundance' and 'Yoder.' Since their long taproots make the trees difficult to transplant, make sure the nursery from which you buy plants has a sensible guarantee policy. Shagbark hickories are not grown exclusively for their nuts. In fact, one could easily rank nut production only third among the reasons why homeowners might consider planting them, as explained below. 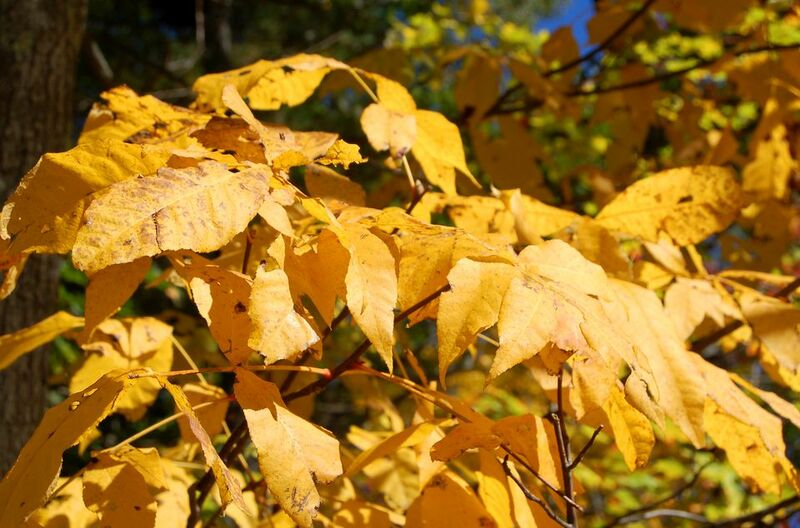 Shagbark hickories are deciduous and provide excellent fall foliage color. In autumn their leaves turn a golden color -- richer than the yellows displayed by the maples. "Shagbark" hickory trees derive their picturesque name from the interesting peeling bark they bear. This unusual bark juts out from one or both ends, curling outward. Even when the leaves are long gone from the deciduous trees in winter, this feature provides landscape interest. The fragrant nut the trees bear is said to be the tastiest of any of the hickory nut trees. The scientific name of shagbark hickory nut trees is Carya ovata, which translates literally as, "the oval nut." Meanwhile, the word, "hickory" comes from the Algonquin, "pawcohiccora". The nuts were an important food source for the Algonquins. Grow them in well-drained soil. Plant so that the root collar rests just below ground level. Fill the hole back in with topsoil, tamping it down as you proceed. Suppress all weed growth within a yard or so of your nut tree by mulching. Like most hickory trees, shagbark hickory nut trees are susceptible to canker, a wood-rotting fungus that will kill the tree. Keeping trees well-watered and scraping off discolored wood may help slow the spread of canker. Shagbarks also are vulnerable to anthracnose, which causes brown spots on its leaves. While it may lead to leaf loss, anthracnose isn't considered a threat to a tree's health. Among the insects that plague the shagbark hickory are aphids and the aptly-named hickory bark beetle. Keeping trees well-watered is one way to avoid insect pests, but spraying with an insecticide (which is labeled as safe for the tree) is usually the only way to eradicate the bugs completely. Refrigerate or freeze the nut meat after you have removed it from the shells. Do not try cracking the husk prematurely unless you are a glutton for hard work. Rather, wait for ripening in autumn. Ripening begins in September and October. The green, leathery husk eventually turns brown and becomes more brittle. In fact, sometimes, when the nuts fall to the ground, the husks split open into four segments, allowing access to the nut within. Even then, you have still got the hard outer nutshell to crack. For this reason, some harvesters just wait until late autumn for all the nuts to fall. Just be aware: Rodents and other pests are fond of shagbark hickory nuts and may get to them before you do. Squirrels, raccoons, chipmunks, and mice are among the critters who like these nuts. The wood of shagbark hickory nut trees is very hard, and it is used to make ax handles, baseball bats and other products that demand a tough lumber. The wood also makes for excellent firewood. What Are Good Trees if You Have Allergies?